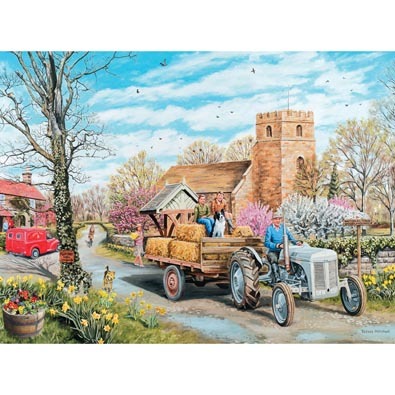 This 1000-piece jigsaw is designed by Trevor Mitchell and measures 51cm x 68cm. A tractor drive a wagon of hay past a church on a blue-sky day. This 1000-piece jigsaw is designed by Trevor Mitchell and measures 51cm x 27This puzzle depicts a nurse making a house call to a new mother. Available in two piece counts. This 1000-piece jigsaw is designed by Trevor Mitchell and measures 50 cm x 69 cm. A car has to stop in the middle of the road to allow some peaceful jay-walkers to make their way across the street to the brook. Available in two piece counts.